Yesterday was my two year anniversary working for Chief Automotive Technologies, as a Design Engineer. 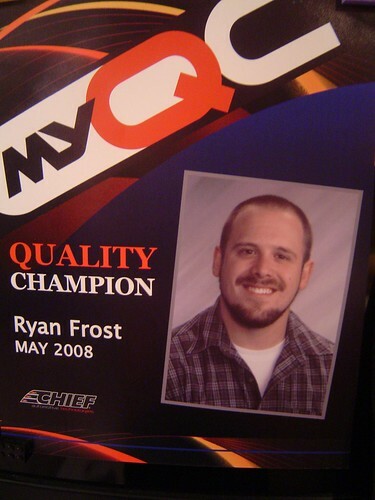 I am the companies first MyQC Quality Champion. MyQC is a new program the company started to try to improve the quality of our products. This poster was hanging up around work for a whole month, I also got a plaque. It is kind of like employee of the month, it is kind of BS. I dodge a bullet about 6 months ago, the company had layoffs and the other design engineer got axed. I am currently the only design engineer and after the last 6 months of not knowing if I am going to have a job tomorrow, I am finally designing some new products. Of course upper management wants a working prototype to show at NACE, in a month and a half and I just started drawing concepts…yea! This entry was posted on September 6, 2008 at 1:44 pm and is filed under Work. You can follow any responses to this entry through the RSS 2.0 feed. You can leave a response, or trackback from your own site. as Demetri would say, you are a winner and a looser at the same time!